A Double Dummy analysis of the boards played in EBU and EBED Simultaneous Pairs events is available. To start the analysis, click on 'View DD analysis and replay hand' between the commentary and score frequency. It will open in a new tab in your browser. Start by clicking in the table in the bottom right corner to select the correct combination of declarer and the suit in which the contract was played. The cards of the player on lead will be highlighted. The small numbers (like the values on scrabble tiles) indicate the number of tricks which can be made by that player if that card is selected. Cards highlighted in green give the best result for that player (assuming optimal play by all players from that point forward), the cards in yellow an inferior result. The number of possible tricks will update as each card is played. Click on a green or yellow card to play it. Cards highlighted in blue are cards already played as part of the current trick. 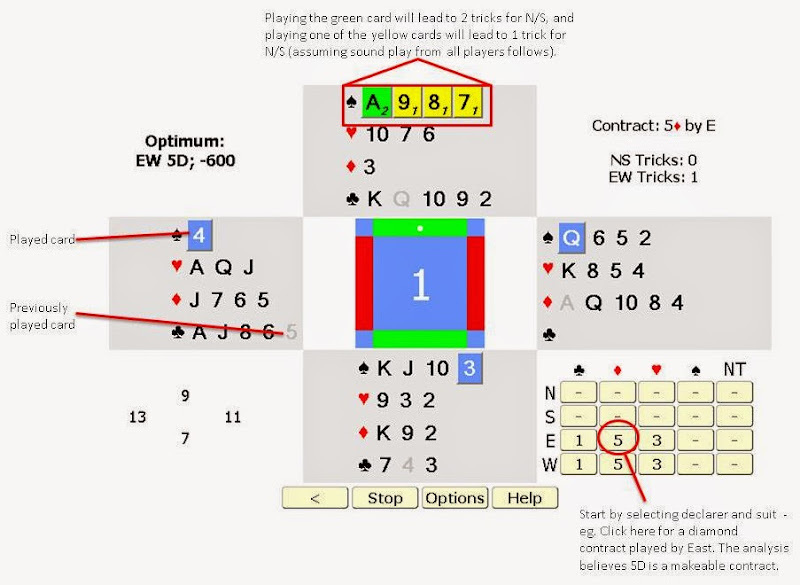 Cards which are greyed out have been played as part of a previous trick. The button marked with a back arrow can be used to unplay one or more cards. The 'options' button allows for some modification of the display format. 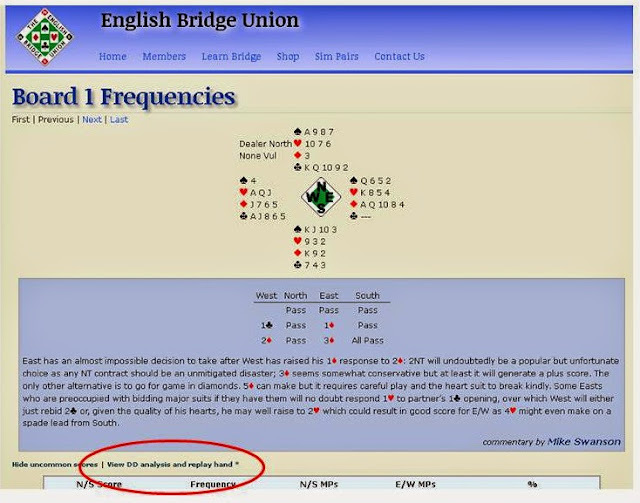 Thank you to John Goacher, author of Bridge Solver Online, for providing this analysis tool, and BridgeWebs for hosting it.